You’d be forgiven for thinking that the Korean university of Ulsan was skating on thin ice when it proposed to send audio from its radio station and broadcast studio to remote clusters of speakers in its ice rink over a stretch of some 500 feet (150 meters) with no loss of sound quality. Transporting audio signals over such an expanse without sacrificing quality often presents system designers and contractors with a challenge and end users with expensive options. An Aviom audio network allows audio to travel from Ulsan’s radio station and broadcast studio to remote clusters of speakers in its ice rink. Modules for source selection. Aviom products are renowned for solving problems in a variety of different environments, including live sound reinforcement, audio recording studios, houses of worship, theater, broadcasting and post-production facilities and a host of commercial installations. 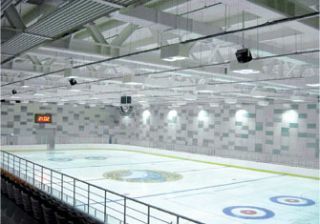 The system created for the Ulsan ice rink exceeded both the contractor’s and the university’s expectations. Based on Aviom’s groundbreaking proprietary audio transport protocol A-Net, the AN-16/i provides 16 balanced line-level inputs into a Pro16 system. Audio is converted to digital and transmitted via A-Net, up to 500 feet/150 meters over Cat-5e. A dedicated audio Thru is available for each input channel, allowing the AN-16/i to be seamlessly inserted into an existing audio signal path. This maintains crystal- clear audio quality and strength of the audio signal as it travels over long distances. The AV-P2 Output Module provides up to two channels of analog outputs from a Pro16 A-Net digital audio stream. The analog output level for each channel is set with front-panel switches, and the modules can be connected in any combination of serial or parallel connections using Pro16 ANet distributors. In addition to creating a system that distributed high-fidelity audio over a long distance and provided multiple speaker sends, the solution attracted additional plaudits by costing less than the university had anticipated because it utilized inexpensive and easy-to-install Cat-5e cables.